The three were forced to stay in the US before their trial. 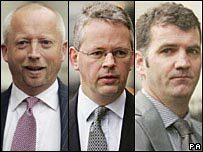 Three British bankers extradited to the US on charges linked to Enron each look set to face a 37-month jail sentence. David Bermingham, 44, Gary Mulgrew, 45, and Giles Darby, 44, the so-called NatWest Three, admitted one wire fraud charge after a plea bargain. A Texas judge must approve the sentence agreed as part of the deal. The bankers had faced up to 35 years in prison. They admitted conspiring with ex-Enron staff to defraud NatWest of $19m (£9m) and then split $7m between themselves. The men they conspired with - Andrew Fastow and Michael Kopper - are already in jail. According to the charges brought by prosecutors, the three men advised their former employer, NatWest, to sell part of a firm owned by Enron for less than it was worth. The three men then left the bank and bought a stake in the Enron-owned company, before selling it on at a higher price for a profit. Mr Bermingham of Goring, Oxfordshire, Mr Mulgrew, a Glaswegian who now lives in Brighton, Sussex, and Mr Darby of Lower Wraxall, Wiltshire, will be sentenced on 22 February and hope to serve their jail term in the UK. They had previously protested their innocence to seven charges. "By changing their plea, Gary, Giles and David have fully accepted the responsibility for the significant lapse of judgement that led to the filing of these charges and which has caused them to be separated from their family in the UK for more than 17 months," lawyer Reid Figel said. As part of the plea bargain, they are to pay $7.35m to the Royal Bank of Scotland, which now owns NatWest. "Under the terms of the agreement... the three have agreed to immediately pay RBS $1.2m," RBS Group said in a statement. "Judgement in favour of RBS is also being entered against them at the High Court, London for an additional $6m. This will be in full and final satisfaction of RBS' claims against them." The trio were arrested in the UK in 2004 and the case hit the headlines last year as the three men fought against their extradition to the US. They were extradited in July 2006 under a new fast-track system agreed by the UK government. All three have been on bail since shortly after their extradition but were barred from returning to the UK before their trial. 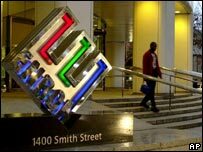 Enron, once the seventh-largest company in the US, collapsed in 2001 with debts of $31.8bn (£18.3bn) after it was revealed that it had fraudulently hidden vast losses from investors. The guilty pleas showed "the extent of the fraud at Enron went well beyond US borders" said Kenneth Kaiser, assistant director of the FBI's criminal investigative division said. Wire fraud is a US legal concept that allows for higher penalties against any fraudulent activity, if the activity in question involves electronic communications of any sort. It is often used as a means for a federal prosecution of what would otherwise have been a matter for a state court.